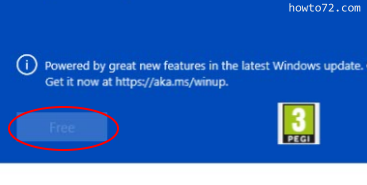 On Windows 10 store, when you want to install and already choose the app but there is no active install button and give the information like this : 'Powered by great new features in the lates Windows update. Get it now at https://aka.ms/winup'. You must update the Windows by following the link provided (https://aka.ms/winup). From the link, you will have the exe file for Windows 10 Update Assistant. With this assistant you can monitor and see the progress of Windows updating/upgrading. It will take a while (depend on Internet speed), you can minimize the page of Windows 10 Update Assistant and continue to your work. At the end, the computer need to restart. After updating is finish, you can go to Store (Microsoft Store) to install apps.